The latest generation of the X-Charger series is slimmer and lighter, and therefore much easier to carry. Its extremely compact dimensions mean that this elegant emergency powerbank, with a lithium-polymer battery, is always at hand, ready to boost any battery, making it an even more efficient companion for everyday use. The charging speeds-on both the input and the output-have been significantly increased, meaning that the X-Charger now boasts even fast charging. The XLayer Powerbank X-Charger is the mobile power supply for your smartphone, iPhone, tablet and more. It can even charge two mobile devices at the same time - and on the move! This 5000-mAh device has two USB ports and allows simultaneous charging. Devices with the new USB-C connection are also compatible, so you are well prepared if your battery goes flat while you are on the go. 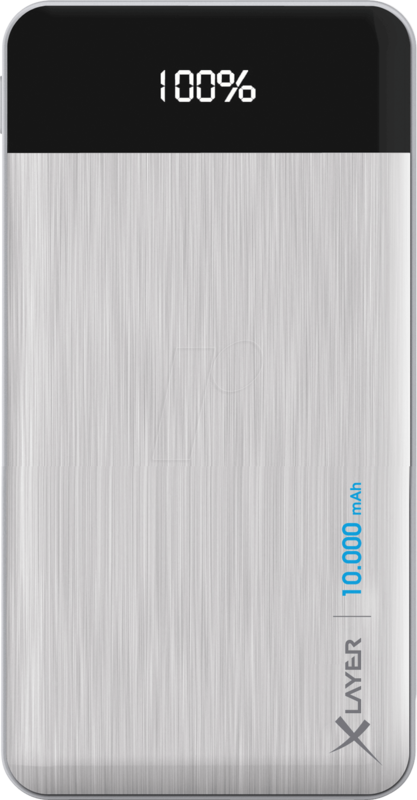 This additional battery gives you three full charges for your iPhone (10,000 mAh) and a numerical capacity display keeps you informed of the charge status of your powerbank. The replacement battery itself is also charged via the USB-to-type-C cable, which is included in delivery. This powerbank is compatible with all smartphones, tablets and other USB-powered devices with a 5-V input.